At least three members of the public report that they attended at the Federal Court in Toronto but were unable to find the courtroom where my judicial review against the Canadian Judicial Council was being held. Even the front desk and security staff were unable to direct them to the courtroom – so they went home after being falsely informed that no such trial was taking place in the building that day. This happened because Federal Court staff deleted the name of Justice J. Bryan Shaughnessy from the list of parties and cases used to direct persons to the various courtrooms. Over the two days about a dozen members of the public, all strangers to me, did manage to find the courtroom on the 7th floor and attended to listen to the proceedings and/or to wish me well. Some of the persons attending on the first day, Monday November 20, 2017, found the courtroom by going to every floor in the building and asking each security guard about the case. They then posted the location on Facebook for others to find. This is incredible: in a case that is ultimately focused upon the disgusting actions of Justice Shaughnessy violating the Open Courts Principle by his secret backroom actions, members of the public were prevented from attending at the Judicial Review because Federal Court staff deleted Justice Shaughnessy’s name from the daily courtroom listings. Another interesting happening in relation to this Judicial Review is that Julian Fantino, former Commissioner of the Ontario Provincial Police, applied to intervene in the case – filing an application and supporting affidavit sworn September 28, 2017. On October 25, 2017, Prothonotary Mandy Aylen rejected Fantino’s application. Fantino then filed an appeal of the rejection, to be heard on November 20, 2017 prior to the Judicial Review – however on Thursday afternoon, November 16, 2017, effectively one day prior to the court date, Justice Keith M. Boswell issued an order that Mr. Fantino’s appeal would not be heard and would be scheduled for General Sittings. But – the Judicial Review would go ahead anyway without Mr. Fantino’s intervention or waiting for another court to hear his appeal. This is puzzling to an ordinary person like myself who always thought that when something is appealed by anyone, the main case is put on hold until the appeal is heard. Perhaps one of my readers with a legal background can explain this as Justice Boswell issued no reasons to accompany his decision. 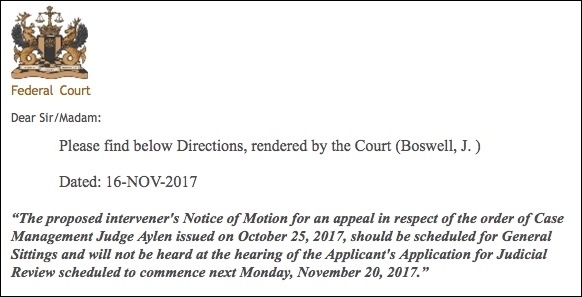 The Judicial Review was heard over two days, Monday – Tuesday November 20-21, 2017. My lawyer Paul Slansky took the first day to state my case that, among other issues, the court should send the Shaughnessy complaint back to the Canadian Judicial Council with instructions to do their job properly according to the laws that govern the CJC. On Tuesday, Mr. Peter Wardle (representing Justice Shaughnessy) and Mr. Victor Paolone (Attorney General of Canada) made their presentations trying to defend the indefensible actions of Justice J. Bryan Shaughnessy. At the end of Paul Slansky’s reply comments on Tuesday, Justice Boswell said he will be issuing his decision later. My sincere thanks to everyone who came out to show support and to monitor and report on the proceedings.